Definition: Vertical Integration, as the name suggests, is the combination of firms engaged in different levels of the distribution chain, in the same industry. It involves the augmentation of the firm by uniting the former and latter productive processes. In this form of merger, the company opts to engage in the businesses, which have some link with the existing business line. In finer terms, it refers to a process, in which a single entity governs the production and distribution of a product or service, so as to enhance the dominance of that company in the marketplace. 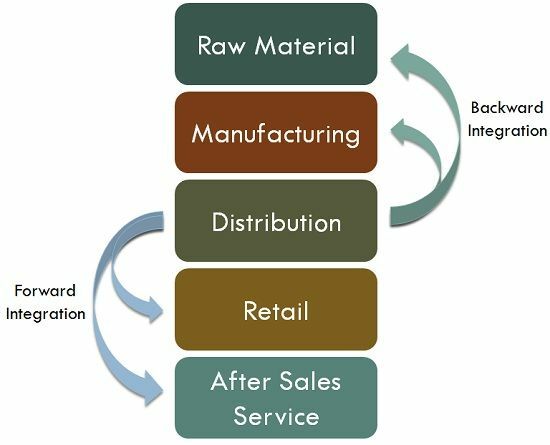 For instance, when a company takes over its supplier of raw material or its distributor of finished goods to final consumers, then such a strategy is known as vertical integration. The implementation of vertical integration results in the reduction of overall production cost, by eliminating price markups at different stages of production and distribution. It also increases the operational efficiency, by decreasing the transportation expenses. Moreover, it attains cost efficiency, as the quality is controlled at each step, which decreases the cost of repairs, returns and downtime. Forward or Downstream Integration: When the company takes control over its consumer company or say distribution centre, to which the company sell its products, it is known as forward integration. The strategy aims at attaining higher economies of scale and occupying larger share in the market.Due to the drastic change in the technology, in the 21st century and increase in the number of internet users, the forward integration strategy gained much importance. There are a number of manufacturing entities, which exist online, and sell their items directly to the customers, thus bypassing the intermediaries in the supply chain process. Backward or Upstream Integration: When the company acquires its suppliers and manufacturer of raw materials, then the merger is termed as backward integration. In upstream integration, the company enters the business of input providers, so as to create effective supply and possess greater dominance over production.The strategy aims at improving the company’s operational efficiency, save costs and also increase the profit margins. When it comes to implementation, vertical integration is the most difficult strategy, which is not only expensive but also hard to take back. However, once the strategy is adopted, it captures both upstream and downstream profit margins. Vertical integration can create the entry barriers, for prospective rivals, predominantly when the vertically integrated company owns almost all the scarce resources engaged in the process of production.